Back in May the girls and I embarked on our biggest adventure to date. We went abroad just me and my three – I know mad aren’t I. To say I was nervous before was an understatement; I had only ever flown with other adults on hand to help out with the girls. But it was amazing, we had the best two weeks ever at the Holiday Village Turkey. I wanted to share with you all the reasons you should visit if you are looking for a truly fantastic family holiday. The weather – Do you want to almost certainly guarantee gorgeous weather for your holiday? Me too, Turkey is the pace for you. Of corse they do have the odd bit of rain, we actually experienced a rain shower and it was great the kids stayed in the pool, it lasted all of 10 minutes and was actually super refreshing but they are few and far between. The reps – It’s almost as though they found the most friendliest group of people, with the most energy and stuck them all at The Holiday Village Turkey. They were great! The children got stuck into activities and they were so helpful. The rooms – Amazing to find a room that will sleep up to 6. Really comfortable, nice modern decor and lots of storage. Well cleaned each day with fresh towels too. The kids clubs – Loads on for the kids to get involved in. All the staff are from the UK and have DSB checks. Make sure you go along to the welcome meeting to get the kids signed up (they also get a t-shirt and water bottle). The pools and slides – SEVEN POOLS! Yes you have to get up early to out your towel out if you want a good spot but you have seven pools to choose from. Nice shallow splash pools for the little ones are brilliant. The slides are open for two hours in the morning and evening and they are so much fun. My girls just went round and round for 2 hours having a blast. The excursions – We went on two fantastic trips; first was to the mud baths and turtle beach which we loved. The hotel has so much to offer but 2 weeks in the same complex means it’s nice to get a change of scenery. The second trip was the Pirates of Sarigerme – amazing. I highly recommend to anyone with children the girls were so well looked after and we had such a laugh. Evening entertainment – the girls adored the evening entertainment. Live & Loud was for sure their highlight and they still do the KouKou move now – if you know you know ;). The food & drink – We ate in the main buffet restaurant most nights, each night was a different theme and there was loads of selection. The children had a separate section they could choose from with ‘kid friendly options’ and plastic plates and cutlery. They loved being able to do it all themselves. Lunch was often quite busy but we did tend to eat bit later on to avoid the queue. The price – 2 weeks all inclusive, in May, in a fabulous hotel for well under £2,000. I couldn’t believe it. Make the most of the free child spaces to really get the best deal. It was such great value for money. I am not usually one to want to return to the same hotel, I love trying visiting new places. But Holiday Village Turkey was amazing. I would definitely go back for another family holiday. Traveling just me and my three was a daunting experience but it went amazingly and I would gladly do it all over again. 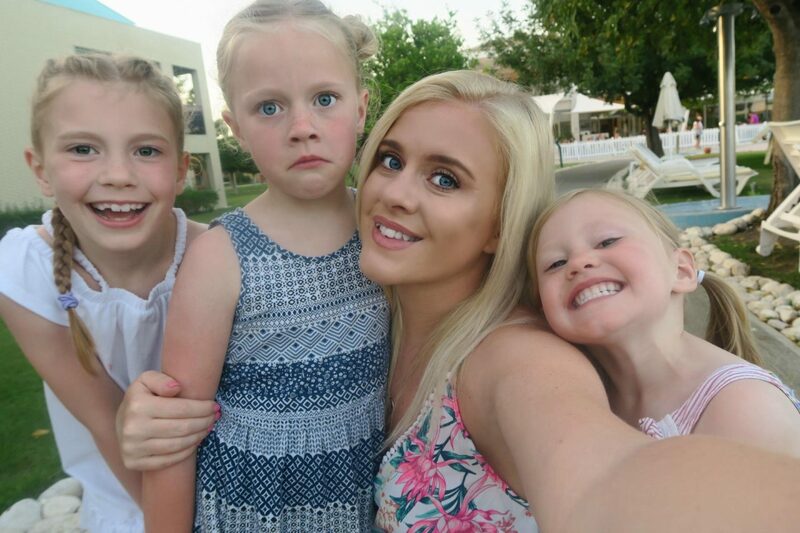 Check out the little vlog I made from our holiday too! That looks like so much fun! My family and I love going to places like this. Holiday Village looks like the perfect place to make some great memories. This looks like such a fun place to visit! And, what amazing family memories you are making. All I can say is WOW! I love seeing and learning about places I would have never even considered traveling to, especially places that would be fun with the kids. Thank you. Whew! Girl you are BRAVE! I have one and I’m too chicken to go anywhere further than a few hours drive just yet, haha. It looks like you had a blast which is wonderful! I have never been to Turkey. I love going to places like this and really it looks like a great place to spend some quality time. This looks so amazing! Would love to go one day with my kids! You guys look like you had a really good time! And my kids would never leave the pool. It sounds like you had a great time (who wouldn’t with SEVEN pools)! Turkey sounds like a lovely place to visit. This looks like an awesome family vacation. Thank you for being detailed on the various activities available and the price. Holiday Village sounds like a wonderful place to spend time with family, and make some truly great memories. I’ve never even been out of the country, but I have an entire bucket list for out of country visits. I hope that I will be able to visit them all one day. Holiday village looks great. We went to Turkey a few years ago and planning on returning next year. You have very adorable daughters and looks like they have lots of fun. 🙂 Stay blessed. Wow, such a detailed post that would be so helpful to plan a great trip to Turkey. Loving the pictures so much. It looks like you guys had a wonderful time!! If I am ever traveling abroad Turkey will definitely be on our radar now!! We visited the same hotel last year in May half term. We had glorious weather and I would echo everything the lady says in her review. My children still talk about that holiday now.